Forget diet perfection—discover a new approach to eating with this beautiful cookbook In this unique and welcoming cookbook, Sarah Adler invites readers to cultivate a healthy lifestyle that will actually last. Adler is your nutritionist, your life coach, and your best- friend-who-makes-the-best-food all rolled into one. With more than 100 easy #antidiet recipes to share, she makes getting healthy effortless. Her enthusiasm comes through on every page, with chapters including “Weekday Work It” breakfasts and snacks to share in “Aperitifing Is a Verb.” Recipes are all gluten-free, many with five ingredients or fewer, and have options to customize for other dietary needs. Stunning photographs of each dish make this book a pleasure to read. 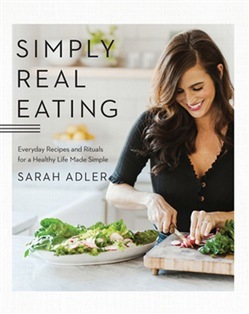 With recipes such as Warming Sweet Potato Muffins; Fire-Roasted Herby Corn Salad; Broccoli, Basil, and Goat Cheese Pizzas; and Salted Dark Chocolate Peanut Butter Cups, Simply Real Eating includes all the practical tools and healthy rituals you need. Acquista Simply Real Eating: Everyday Recipes and Rituals for a Healthy Life Made Simple in Epub: dopo aver letto l’ebook Simply Real Eating: Everyday Recipes and Rituals for a Healthy Life Made Simple di Sarah Adler ti invitiamo a lasciarci una Recensione qui sotto: sarà utile agli utenti che non abbiano ancora letto questo libro e che vogliano avere delle opinioni altrui. L’opinione su di un libro è molto soggettiva e per questo leggere eventuali recensioni negative non ci dovrà frenare dall’acquisto, anzi dovrà spingerci ad acquistare il libro in fretta per poter dire la nostra ed eventualmente smentire quanto commentato da altri, contribuendo ad arricchire più possibile i commenti e dare sempre più spunti di confronto al pubblico online.